The family cemetery located just off Maple Avenue and Route 17k is in need of preservation and maintenance. A slave cemetery is speculated to be on Colden's property, its exact location uncertain. Therefore sounding is required to locate this area, a process used a few years ago to verify that soldiers were buried at a purported Revolution War cemetery located in Fishkill, N.Y.. There are two older buildings on the former Colden property. One is in shambles. The other is in need of preservation and possible transfer to the visitor's site at Rte 17k and Stone Castle Road. The Coldens and their neighbors are associated with the unearthing of one or more preserved and/or semi-fossilized mastodons. This discovery became a major promoter of the controversy on the evolution theory, which took a hold of science 30 to 40 years before Charles Darwin's publication on evolution theory was published. Colden's natural philosophy work, in 1703 at Edinburgh, was devoted to this new field of natural science. The Mastodon was found in a pond/wetland area located at the edge of Colden's property on 17k. Cadwallader Colden's very first published article is about the latitude of the tip of Manhattan island. He deduced this measurement using Galileo's method of mapping the moons of Jupiter as they crossed its face and horizon of their planet. This enabled Colden to mathematically determine where New York was relative to the earth’s moon, Jupiter’s moons, and the planets, all in turn relative to the earth’s position and location relative to the sun. He then published his page long formulas on this calculation of the exact latitude for the southern tip of Manhattan Island. Prior to this publication in 1723, captains had to sail the well documented Boston or Philadelphia routes and then follow the shoreline to find New York. Colden wrote the first Flora of New York and the Mid-Atlantic colonies while residing on his land around 1737. It was submitted to Carl Linne and later published in 1749 and 1751. Colden is accredited by Linne with promoting the current binomial (two name) system for defining scientific plant names. Six specimens of Colden's botanicals remain in the Linnaean plant collection. A canal was built on Colden’s property in the 1720s or 1730s, and served in the transportation of materials across his property. This is the country's first known canal. Cadwallader Colden's daughter Jane is famous for being one of the first female botanists. She documented some of the first ethnobotany of this region, including foods and medicines use by the Iroquois Indians, and the locals whom she called "Hudson'ns"
The most important plant Cadwallader Colden introduced to science is probably the prickly ash, which he termed xanthoxylum; the rush to publish this discovery by a French botanist led to a misspelling of this name, still in use today, zanthoxylum. Since the French writing was printed and distributed before Colden's work, and made the plant famous, it is often considered the official scientific name for this plant. Cadwallader Colden, while he was Lt-Gov. of the New York Province, entered into one of the most heavily publicized arguments concerning the rights of the poor. He argued extensively with British writers about the true meaning of their recommendation of "tarwater" for use as a universal medicine to treat the poor. The underlying symbolism of this “remedy” was revealed by Colden and published in a controversial article focused on social inequality. Around 1750, Cadwallader Colden wrote a famous book on the Iroquois Nation in New York. This two volume book contained a map and documented many of the first activities engaged in by New York Indians. Its focus was the uniqueness of the Iroquois government. Colden documented the ability of corn to bear a fruit (the kernel) of many colors. As a result, he traditional polytypic multicolored nature of Indian Corn r Maize came to be well-known . Cadwallader Colden published a pamphlet redefining the theory of the universe, with its rotating planets, and the theories of gravity and light proposed by Isaac Newton, whom Colden regularly corresponded with. This pamphlet was publicized and criticized by British writers in the weekly magazines circulated in England and Europe. Following Newton's death, Colden's pamphlet became very popular. It inspired natural science students to study microorganisms, equating Newton's theory with a new theory of life. The vital theory of life became very popular as a counter to the popular mechanical theories of life. A young travelers' tale tells of this pamphlet, that was circulating amongst the tea and coffee houses in Paris; she notes in a letter to a friend how it inspired her to came to learn about the smallest living beings. The early science of microbiology was then born. Another direct result of Colden's population vital force work was the development of various forms of medicine unique to the profession for the Hudson Valley. His theory was a continuation of the popular "nervous energy" then promoted by some doctors. The resulting medical devices invented due to this philosophy include galvanic (battery like) devices, static electric glass generators, and medical uses for the lightning rod placed on houses, ie for treating palsy (polio) and paralysis (stroke), a belief Colden shared with Benjamin Franklin. Colden was in direct contact with a number of scientists, including numerous botanists. But his most famous correspondence is perhaps with Benjamin Franklin. Colden and Franklin created a new type of printing press that was unique to the field. Cadwallader Colden is responsible for a number of legends or folk tales about snakes. His most famous one relates to the vital energy theory. He believed snakes used this energy to charm or hypnotize their prey, without need for a rattle or venom. He based this on frequently witnessing the large black snake charming its prey on his property. He also made numerous notes about a snake unique to his corn field, now known as the corn snake. These tale were extremely popular in local and were frequently modified and retold to kids. One famous variation of one of Coldens’ stories is the myth that the snake can charm young children at the breakfast table, in order to sip the milk their breakfast was mixed within (early cereal). Colden's grandson David Colden was one of several who assisted Chancellor Livingston in making Robert Fulton's steam powered ship famous. Colden wrote about the use of the local pokeweed to treat cancer. In the late 1970s it was found to contain pokeweed mitogen, a small protein known as a lectin that is used for cancer research. The members of the Coldengham Preservation and Historical Society respectfully request that a CEMETERY BUFFER ZONE is included in the proposed Gaming Overlay District, and we request that the Planning Board make such recommendation to the Town Board. The Colden Family Cemetery (31-1-53) is a parcel owned by the Town of Montgomery. This plot will be surrounded by casino owned property with the sale of the 59 acre Pimm property (31-1-95) which will be included in the Gaming Overlay District. The Colden Family Cemetery, which is listed on the New York State and National Registers of Historic Places, should be given the highest level of protection that the Town of Montgomery can offer. Therefore, CP&HS is requesting that the Town of Montgomery Board give serious consideration AT THIS TIME to including a CEMETERY BUFFER ZONE in the aforementioned introductory legislation. Several communities in Orange County have laws regulating development surrounding cemeteries. They are: Town of Chester (100 Foot Buffer Zone); Town of Goshen (200 Foot Buffer Zone); and, Village of Woodbury (200 Foot Buffer Zone). Taking into consideration the fact that the Town of Montgomery lacks such protective ordnance, CP & HS feels that it is important to include it in the provisions of the overlay zoning. As you are aware, zoning codes should reflect the vision of the community. An overlay zone, in this case, while allowing certain uses that are not part of the current zoning, should also protect that which is already on the site, both built and natural features. Even though the applicant in the current proposal has agreed to a buffer zone around the Colden Family Cemetery, it would be to the public benefit to codify a minimum 100 foot buffer zone so as to clearly define the present and future development of the site. 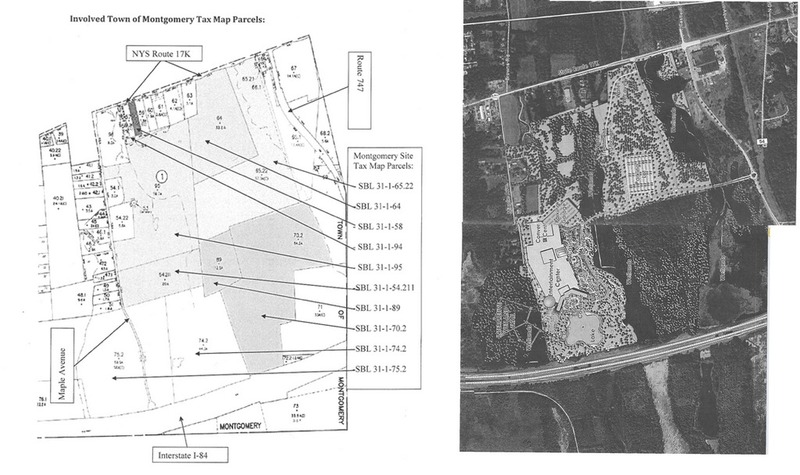 In the absence of an updated comprehensive plan, we feel that such measures are necessary to protect this significant property and the Town Board, as owner of the cemetery, should do so at this time under section 70-100-80.4 (Specific design standards of the special exception use permit) of the aforementioned introductory local law. The early development of the area that is now the Town of Montgomery can be traced to the land patents issued to Cadwallader Colden in 1719. When Colden settled this area he brought his family here to live on the property on what is now Maple Avenue. He opened up the territory with the relocation of Palatine settlers from Newburgh who became the early farmers of Montgomery. He surveyed and constructed the road that connected these early farms to the Hudson River. Although Cadwallader Colden, Sr. is not buried in Orange County, over 60 of his descendants and family members are interred in the Colden Family Cemetery. We, and our descendants, can forever respect the memory of this family and their important contribution to the Town of Montgomery by protecting the COLDEN FAMILY CEMETERY. AUG 21ST AT 7 PM in the Town Hall regarding Intro Local Law #1 Gaming Overlay District. The Town Planning Board has recommended that the request made by CP & HS be included. The proposed site plan for the casino development is in the attached Cultural Resource Survey. You can see that the cemetery will be surrounded by the casino project. I have also attached the memo from CP & HS to the Town Planning Board. They will be including that with their recommendation to the Town Board. The casino developers are putting the push on the Town boards; so we must act quickly.